Tri means three and veni means confluence. Hence Triveni means confluence of the three. This place is believed to be the confluence of the Ganges, the Yamuna and legendry Saraswati river. 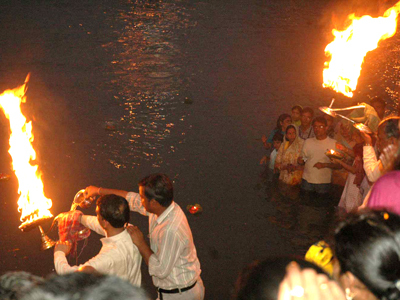 Triveni Ghat holds a spritual value and is considered a great place for pilgrimage. Triveni Ghat is a scared Ghat and bathing spot on the right bank of river Ganges, where devotees take a holy dip and offer their heartful prayers. 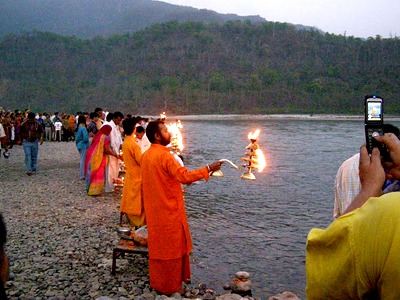 The arti ceremony at Trivani Ghat takes place daily at dusk. An Awe-inspiring sight, when flame of belief illuminates the entire environment and the mind and body rejuvenated by the hymns recited in praise of the Ganges. Devotees release flower-filled leaf boats carrying tiny oil lamps and let them float out on the river, which is the ceremony of worship, rememberance and hope. One must take a boat ride in Ganges to get the joy of nature including gushing waters, mountain ranges, forest and wild life. Boat service is offered by Swami Narayan Mission Society on payment basis. Their usual tour costs Rs 50/person for around a ride of half an hour , if you're in a group you can ask for a tailored tour also. Boat capacity is 8 persons/boat. Boat Service is generally taken off during the monson season because of raised water levels in Ganges. 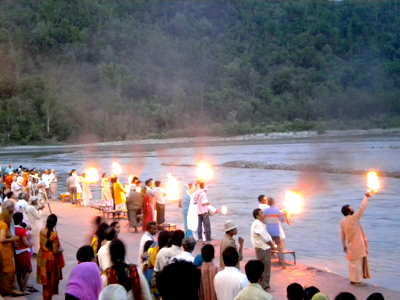 Triveni Ghat Ganga arti is performed on the behest of Ganga Seva Samiti, Rishikesh. Ganga Seva Samiti manages Cleanliness, Lighting , celebration of Festivals, Ambulance Service and Toilets at triveni ghat. To participate in Ganga Arti you can contact Manager, Ganga Seva Samiti, Rishikesh with nominal charges, money thus raised is used for various amenities at the banks of Ganges. Ganga Arti Timing depends on sunset (सुर्यास्त), in peak winter Time is 5:30PM whearas in peak summer it is 7:30PM and at other times it is somewhere between 5:30PM to 7:30PM.